You can download an admit two pass to see the new movie BABY DRIVER at AMC Altamonte Mall 18 - 433 E. Altamonte Drive, Altamonte Springs, FL 32701, on Wednesday June 21st, 2017 at 7:30pm. 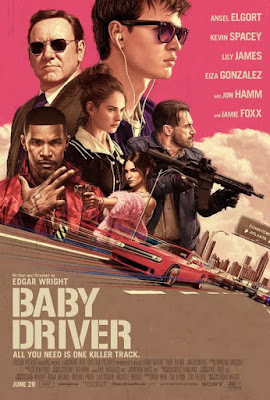 Baby (Ansel Elgort) is a talented, young getaway driver who relies on the beat of his personal soundtrack to be the best in the game. When he meets the girl of his dreams (Lily James), he sees a chance to ditch his criminal life and make a clean getaway. But after being coerced into working for a crime boss (Kevin Spacey), Baby must face the music when a doomed heist threatens his life, love and freedom. BABY DRIVER opens in Theaters on June 28th, 2017. NO PURCHASE NECESSARY. Passes available on a first-claim first-serve basis. You will need to register for a free SonyScreenings account in order to redeem the passes and each registered user account is limited to claim one admit-two pass. SEATING IS LIMITED, SO ARRIVE EARLY. PASS DOES NOT GUARANTEE A SEAT AT THE SCREENING. Refer to screening pass for further restrictions.